It was already announced for February 2011 but then the Egyptian revolution interfered. Now, a new date is confirmed: In October 2011, the Avenue of the Sphinxes, which will connect Luxor and Karnak temples like 3,300 years ago, will be inaugurated by the Prime Minister of Egypt, Essam Sharaf at the beginning of a festival specially organised for the opening ceremony. From then on by night the sphinxes and other monuments along the route will be lit by the Sound and Light Company of Egypt. For the last five years of excavating the 2.7 km long old processional route, spectacular founds were made again and again. Late last year, another sphinx avenue, 600 m in length, was excavated leading from the main one to the Temple of Mut in Karnak. 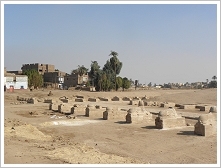 Recently, on 22nd of June, remnants of ancient Islamic and Coptic buildings were discovered including churches, minarets and domes in the Luxor Temple area as well as pieces of pottery, a sandstone river gauge, and an oil squeezer. Totally, seven boat pits were discovered at the Giza pyramid complex. Two on the east side, two on the south side of the Great pyramid of Khufu, one close to the mortuary temple and two between the queens' pyramids. The two pits on the south side were found in 1954. They were covered with slabs of limestone and still contained two intact ships - funerary goods for the deceased pharao - taken to pieces. The eastern one has been recovered and restored. Nowadays, it's on display in the Solar Boat Museum beside the Great Pyramid. The second (western) solar boat was left untouched until 1987. Then, a team of scientists examined it by penetrating the limestone ceiling and inserting a tiny camera in order to ascertain the boat’s status. But the dismantled ship remained in its re-sealed pit for more than 4,500 years - until today. 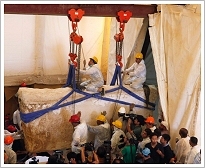 This morning, after the completion of a comprehensive study, the first limestone block, out of a total of 41 that have protected the boat, was carefully lifted. Step-by-step, they all will be removed and the boat’s wooden beams will be extracted and reassembled. To give you some idea of the scale of the work: The weight of one limestone block is up to 16 tons. 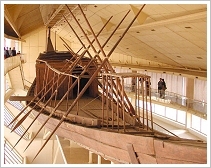 The first boat had 1,224 components of wood, and it lasted more than 10 years to reconstruct this 43.4 m long and oldest preserved boat in the world satisfactorily. The University of Waseda, Japan, enabled the project to lift the second solar boat out of the pit, restore and reassemble it with a grant of $10 million. Upon completion of the restoration, the boat will be erected near the new entrance gate to the Pyramids Plateau, while the first boat will be moved from its current site to the Grand Egyptian Museum, currently under construction at the Giza Plateau. The dispute over the 163 Egyptiian artifacts currently held by the Egyptian Museum Georg Steindorff in Leipzig (see the news of 29/05/11 and 01/06/11) came to a happy end yesterday. During the meeting between Leipzig University and the Conference on Jewish Material Claims Against Germany (JCC) the JCC agreed to leave the collection in place - without payment. The only condition is that the University will document the life of Georg Steindorff and publish it in the museum whilst acknowledging that Steindorff was forced to sale the artifacts due to persecution. The Spanish mission working in the course of Project Djehuti in three tombs at Dra Abu el-Naga announced today (unfortunately just in Spanish) that a mug of beer has been found in one of these tombs dating from approx. 1,500 BC. Thereby, beer ranks to the oldest beverages in the world. Djehuti was Overseer of treasury and Overseer of works, during the 18th Dynasty reign of Hatshepsut. Usually, the Ancient Egyptian offered beer and bread as grave goods to ensure the survival of the deceased's soul in afterlife. Of course, they appreciated beer, made from barley malt, water, wheat flour and date essence, already in life - with a long drinking straw. 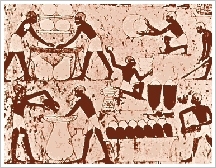 They had even an own hieroglyph for beer: . The hieroglyph for "meal" was composed of the signs for "beer" and "bread" ;-). Global Water Dances is a world event planned for June 25, 2011. On this day communities around the planet, in more than 50 cities, will unite in the Global Water Dances experience. Global Water Dances is a model of how to use participatory art-making to raise consciousness about environmental problems and how to bring people together to work on solving these problems. ... The event will begin at 5 p.m. local time in the Pacific Rim, rolling westward through the time zones. ... Each Global Water Dances location has its own professional choreographer who will produce a four-part site-specific performance. The first two parts will reflect the importance of water as seen by that local community, with movements created especially for the individual outdoor locations. In part three, all dancers worldwide will perform to the same 8-1/2 minute piece of music written by prominent global musicians.. Finally, in part four you can join the dancers. To find the locale, which is closest to you, click here. In Egypt the event will take place in Cairo, Hurghada and El Gouna (although it's not on the list). 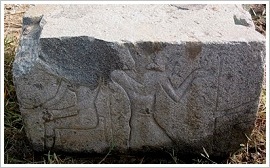 An US expedition unearthed a giant Roman palace in the large Amheida region, 300 km west of Luxor. Anheida was in Roman times the capital of the Dakhla Oasis in the Western Desert. Unfortunately, the palace, which belonged to a person named Sornius, cannot be opened to the public due to erosion, but a copy will be constructed for visitors. 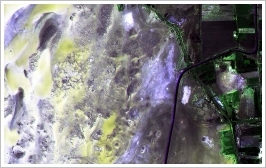 The Amheida project was started at Columbia University in 2001. Since 2008, New York University is the primary sponsoring institution, with Columbia University continuing as a partner in the project. 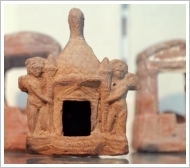 They already discovered an upper-class house with wall paintings dating from the 4th century AD, an adjoining school, underlying remains of a Roman bath complex, a modest house of the 3rd century AD and the temple hill, with remains of the Temple of Thoth built in the 1st century AD. 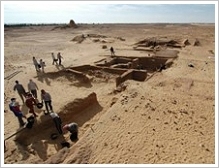 Architectural conservation has protected and partly restored a mud-brick pyramid and several tombs of the Roman period. A recreation of the 4th century house has been built near the site entrance as a future visitor center. 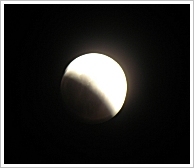 A lunar eclipse occurs when the moon passes behind the earth so that the earth blocks the sun's rays from striking the moon. 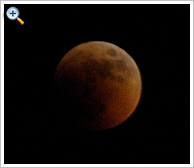 When the moon travels completely into the center of earth’s shadow, one observes a total lunar eclipse with reddened light. It can only happen at full moon. While in Europe the sight was clouded in many places, in Luxor we could enjoy the complete spectacle: one of the darkest and lengthiest eclipses of this century. 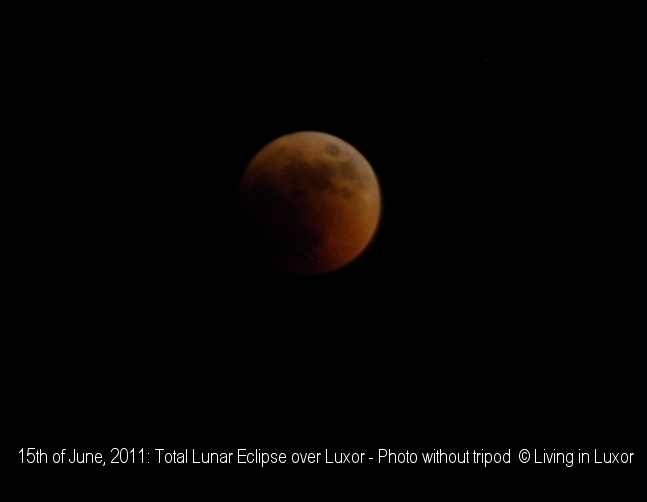 From 9:22 p.m. on, for 100 minutes the moon was totally in earth’s shadow. All in all the eclipse lasted 3 hours and 40 minutes. In Ancient Egypt people attributed an eclipse of the moon to Seth's having stolen the Moon Eye of Horus. Thoth, god of learning and mathematics, searched in the darkness and restored it to its place in the heavens, thus becoming a lunar deity himself. Sami Yusuf was the first international artist who gave a concert in post-January 25 Egypt. With the theme “United in Peace” it took place on 11th of June with an audience of over 2,000 people. The music of the 30-year-old British Muslim singer and songwriter who lived for four years in Egypt propagates a neo-liberal islam without Islamic propaganda. He believes that his music can create a common dialogue between peoples of different backgrounds while at once appreciating the diversity of the global village: “Music can speak to people of all faiths, men and women, adults and children. What I sing about crosses cultural and national boundaries, unifying people in the name of peace. don’t believe in a Christian, western or Islamic civilization, I believe I one human civilization of which we are all part of.” He sings in both Arabic and English as well as various other languages including Malay, Urdu, Farsi and Turkish. Following the January 25 revolution in Egypt, Sami Yusuf composed a song titled “I’m Your Hope”, dedicated to youth around the world. Part of the proceeds from Yusuf’s concert in Egypt will be donated to an organisation dedicated to cancer rehabilitation for children. He released a charity single entitled "Hear Your Call", performed in English and Urdu, to raise funds for displaced Pakistani children in a joint-effort with the UN-sponsored charity organisation Save the Children. Since an earthquake in 1992, the 4,700-year-old Pyramid of Djoser is in danger of collapsing. 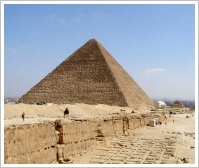 Cintec International, a highly specialised engineering company based in South Wales was set the task to save the pyramid. 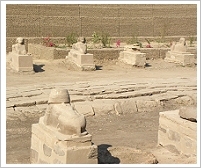 The team has now completed phase one of the work at the site at Saqqara. Initially, it was necessary to hold up the unstable roof of the 60 m high pyramid, while more permanent repairs are carried out. Eleven pillars with a compressed air filling now hold up the pyramid's roof. Another six columns currently being manufactured to support the lower corners of the burial chamber. This is the condition for phase two of permanent repair, when thermo-dynamic steel rods will be threaded diagonally through the steps of the pyramid, in such a way that the six levels will be invisibly knitted together. The steel is designed to expand and contract with the pyramid, under the extreme temperatures of the desert. Finally, the team will reclaim as many of the fallen original rocks as possible, and re-point them with authentic 2,700 BC mortar - its "recipe" has still to be found. Egyptian mathematics, may have unlocked their mystery. "The markings are hieratic numerical signs. They read from right to left, meaning 100, 20, 1. The builders simply recorded the total length of the shaft: 121 cubits", he said. The royal cubit, the ancient Egyptian unit of measurement was between 52.3 and 52.5 cm in length. They cover almost every surface of the famous boy king's tomb in the Valley of the Kings at Luxor's West Bank and pose the reseachers a riddle: ugly dark-brown spots, which spoil the paintings. The chemists supposed that the spots were caused by the transpirating daily crowds of visitors but the spots haven't grown since the tomb was found by Howard Carter in 1922. Another question is whether they present a health hazard for tourists. Ralph Mitchell, microbiologist at the Harvard School of Engineering and Applied Sciences (SEAS) received an order for an investigation from the Getty Conservation Institute, which is responsible for the restoration of KV62. 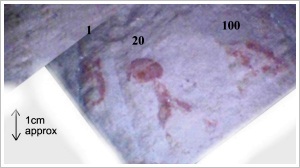 He cultured cells of microorganisms swabbed from the walls of the tomb and conducted DNA sequence analyses. He identified melanins, which are characteristic byproducts of fungal and sometimes bacterial metabolism, but without any match to living organisms. 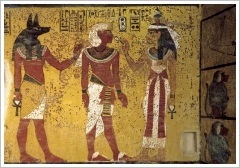 Mitchell assumes that Tutankhamun was buried in an unusual hurry and that the tomb was sealed before the walls were dry. That moisture, along with the food, the mummy, and the incense in the tomb, would have provided a bountiful environment for microbial growth. Good news for tourists is: the microbes that caused the spots are not anymore active and therefore not dangerous. But what to do with the tomb? Mitchell suggests that the conservators leave the spots because the damage is already done and the spots are unique and part of the whole mystique of the tomb. Unfortunately our good news of 05/06/11 came to early. 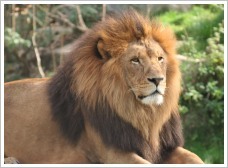 Egyptian newspapers had reported that al-Sayed al-Essawy had been arrested and never bought a lion on the black market. Now, the latest interview ( 85 KB) with the modern-day gladiator (see the news of 29/05/11) was published who fancies himself for the strongest man of the world and wants to proof it by the lion fight. If necessary without any official permit and at a secret place just reveiled to the press. Although he will not boost tourism but caused people threatening to boycott Egypt and any Egyptian products. The fight for the lion which is currently hidden at a friend of al-Essawy continues: "Stop al-Sayed al-Essawy from murdering an innocent lion". Already more than 3,500 people signed. As long ago as 1990, the granite relief was cut from a wall of the Behbit El-Hegara Temple (Iseum), smuggled out of the country and offered for sale at London’s Fine Art Auctioneer Bonhams. In those days, the Egyptian embassy in London could withdraw the artifact from auction. Now, it's back to Egypt and will be returned to its original position at Behbit El-Hegara Temple after restoration. 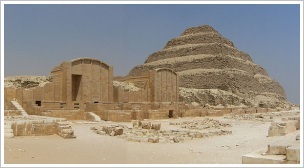 The temple is located at the Nile delta and was built during the reign of the 30th dynasty king Nectanebo II. 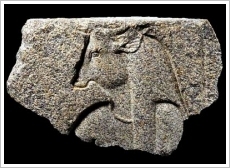 The stolen engraving depicts the cow-headed ancient Egyptian deity Akht. The initiative “A Thousand Gardens in Africa” started in 2010 as a project of Terra Madre®, an international organisation initiated by Slow Food®. The ambitious target is to encourage local people to protect and apply sustainable farming techniques in close communion with nature, landscape and tradition. 450 scientists support them to concentrate their special attention to biodiversity and help to create 1,000 organic food gardens in 17 African countries (already 195 exist). Egypt is part of this project. In collaboration with the Wadi Environmental Science Centre (WESC), Terra Madre® plans 30 Egyptian food gardens in urban and rural settings, schools, villages and city outskirts to promote sound livelihoods and healthy diets. Short distances, organic tasty crops free from chemical fertilizers, that's meaning "Slow Food". Are you interested in this project? Here we have the Terra Madre® Brochure (6.300 KB). From 4th of July to 27th of November, 2011 the 54th international art exhibition entitled "ILLUMInazioni - ILLUMInations" opens its doors featuring 83 artists from all over the world. Chaired by Egyptian artist Hassan Khan the jury presented official awards on celebration of the opening. The central exhibition is paralleled by 89 national participations. As usual, Egypt created a national pavillion. While in the last years very traditional artworks were exhibited this year's presentation suprises with a video installation of the performance artist Ahmed Basiony. Basiony shot video footage in the early days of the Egyptian revolution in Cairo and was killed by snipers on 28th of January during a demonstration at Tahrir Square. Here, we show you a youtube video about the artist's work and its presentation at the Biennale. After massive protests of potential tourists and animal welfare activists, the Egyptian stuntman who planned a lion fight in front of the pyramids to promote tourism (see the news of 29/05/11) has been arrested. According to authorities the man is mentally ill and allegedly never bought a lion on the black market. The Egyptian minister of tourism emphasised that “under no circumstance will the Ministry of Tourism tolerate any degree of inhumane acts against animals.” Hamdullilah! 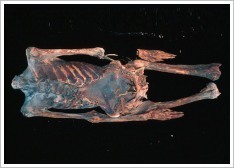 Quite recently, newest research based on body scans of 3,600 year-old mummies showed evidence of atherosclerosis what raised questions about whether hardening of the arteries is really a disease of modern civilization. Now, new evidence of particulates, tiny microscopic particles that irritate the lungs, which he found in the lungs of 1,800 year-old mummies showed that the Ancient Egyptians have been exposed to air pollution. Roger Montgomerie, a doctoral student at the University of Manchester, examined lung tissue samples of 15 mummies. All showed particulates and the levels of them are not much below what he'd have expected in modern-day lungs. The mummies came from a broad cross section of Egyptian life. Some were workers living in the Dakhla Oasis, while others were of the upper class. Apparently, the particulates, which were once generated by cooking, metal working and mining, have been blown up by sandstorms and inhaled. 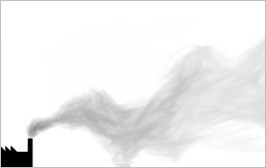 Now, Montgomerie plans to burn different sources of fuel used by the Egyptians and capture the particulates they create as well as gather sand from archaeological sites in Egypt in order to compare both with the particulates in the mummified lungs. It will be at least three months until he has results back from this experiment. Only a joke? No. The Majid Al Futtaim Group, real estate developer specially for hotels and large shopping malls with “wow” factor throughout the Middle East, already realised a similar project in Dubai in 2005. The indoor resort features an 60-meter high indoor mountain with 5 slopes of varying steepness and difficulty, including a 400-metre-long run, the world's first indoor black run, and a 90-metre-long quarter pipe for snowboarders. 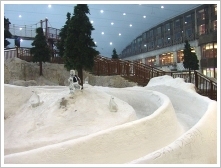 The world's largest indoor snow park can be visited by 1,500 persons at the same time. In Egypt, the resort will not be as large as in Dubai. 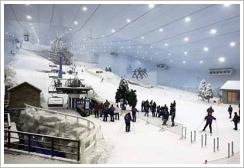 Entitled "Ski Egypt", it will be part of the 4.4 billion LE (514 million EUR) "Mall of Egypt Project" and open by 2014. Not least it's so expensive because an extremely efficient insulation system is necessary. While outside temperatures of over 40° dominate the temperature the hall has to maintain a temperature of -1° C during the day and -7° C at night when the snow is produced. Well, let's go! Or do you belong too to this kind of holiday makers who come to Egypt because of its heat??? 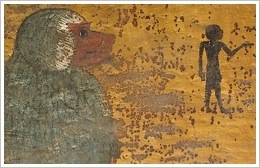 Acquisition of Leipzig's Steindorff Collection - Again? We reported that the University of Leipzig lost the lawsuit over the Ancient Egyptian Steindorff Collection against the Conference on Jewish Material Claims Against Germany (JCC) last week. Actually, the JCC should represent world Jewry in negotiating for compensation and restitution for victims of Nazi persecution and their heirs. But for one thing Steindorff had converted to a Protestant and was never persecuted, for another thing Steindorff's grandson never demanded to restitute his grandfather's precious collection in his name. Quite the contrary. In 2007, the 88-year-old Thomas Hemer had made a claim from JCC in order to be able to donate the collection to the university's museum. He wanted to protect his grandfather's lifework as a complete collection - but was too late. 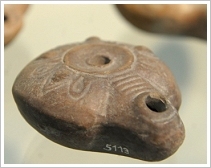 Now, it is to be feared that the JCC will liquidate the 163 artifacts separately and the University of Leipzig's only chance is to buy the whole collection for the second time.